Philip Gorski from the Department of Sociology at Yale University visited campus to deliver a lecture on why white evangelicals voted for Donald Trump and continue to support him with such unremitting zeal on Tuesday, Sept. 25. While Professor Gorski recognized that people of faith often find it challenging to reconcile more progressive stances on issues, especially pertaining to sexuality and women’s reproductive rights, with their own religious beliefs, he ultimately identified the nationalist sentiment of many white evangelical Christians to be at the crux of their political motivations. According to 2016 exit poll results, 80 percent of white evangelical Christians voted for Trump in the presidential election. 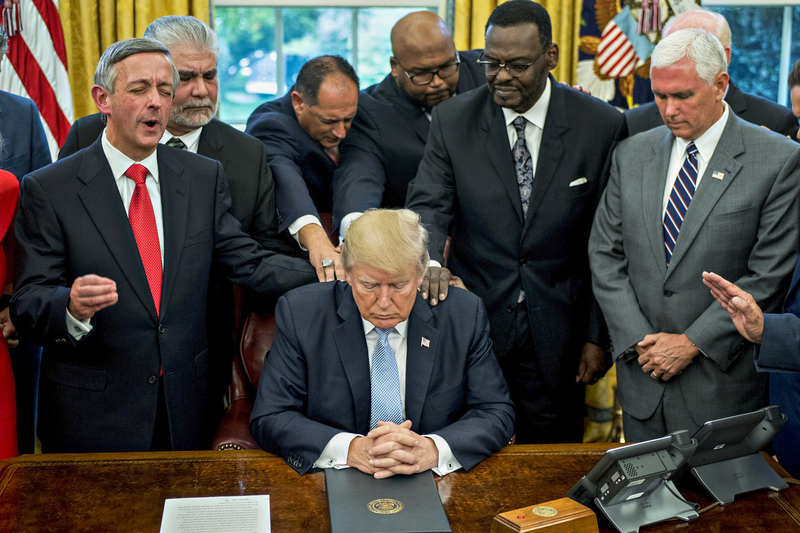 A new PRRI survey also reports that approval ratings for President Trump among white evangelical Christians are high, a remarkable 75 percent compared to his 42 percent favorability among all Americans. Trump’s high margin of victory with this demographic far exceeds the victory margins of George W. Bush in 2004, John McCain in 2008, and Mitt Romney in 2012. In an attempt to further understand the overwhelming support Trump receives from the majority of white evangelicals, Professor Gorski argued that Trumpism is a secular form of white Christian nationalism. These white evangelicals, who frequently disseminate narratives of victimization because of their perceived minority status among Christians as “true-believers,” found a political messiah in Donald Trump during the 2016 elections. Trump’s campaign slogan “Make America Great Again” aligned with their efforts to combat changing cultural norms, preserve a historically Christian nation, and maintain a privileged place in American society. Despite the high percentage of white evangelical Christians who supported Trump, there are evangelical Christians who do not echo this support or champion this nationalist sentiment. As religion and politics appear to become more and more intertwined, young people in particular are growing increasingly disillusioned by both institutions. In a study conducted by PRRI, people ages 18 to 29 are three times more likely than people ages 65 and older to identify as religiously unaffiliated. Tracy Mehr-Muska, the University’s Protestant Chaplain, emphasized in an interview with The Argus that there is a tremendous diversity of belief among Christian sects. Reverend Mehr-Muska has witnessed many Wesleyan students dedicating themselves to fostering an open and inclusive environment for discourse on campus. But students of diverse political leanings might not always feel welcome in those conversations. Mehr-Muska offered some guiding words for students who might find it challenging to engage in discussion with students whose opinions starkly oppose their own. Serena Chow can be reached at schow@wesleyan.edu.